“What need has nature of thought, of care?” asked Confucius in the 5thC. BCE. “Plenty” is the answer he’d receive today, as we struggle with the effects of global warming, deforrestation, salination, loss of species and habitat. In the so-called ‘Anthropocene’ era nature needs all the help it can get. Having worked so dilgently to destroy the Earth’s ecosystems humankind is now faced with the problem of how to repair the damage. Janet Laurence, whose survey, After Nature, may be seen at the Museum of Contemporary Art, is an artist of the Anthropocene age. For the past two decades she has explored the issues associated with the world’s booming ecological crisis. Laurence dates her decisive ‘conversion’ to the early 2000s when she undertook a residency in Chiapas, Mexico, in a region devastated by land-clearing. “I became politicised,” she declares in the catalogue. This politicisation is apparent in the elaborate installations Laurence has produced since 2005. 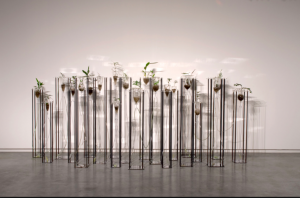 Waiting – A Medicinal Garden for Ailing Plants(2010) was shown in the Royal Botanic Gardens, as part of the 17thBiennale of Sydney. Deep Breathing: Resuscitation for the Reef(2015-16) was first shown at the Muséum national d’Histoire naturelle in Paris during a exhibition on the theme of Climate Change. 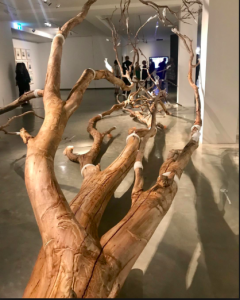 A work called Heartshock(2008), which used a dead tree to make a point about faltering eco-systems, has been reworked for the MCA exhibition, and retitled Heartshock/After Nature(2019). Laurence has made a new installation for this exhibition, called Theatre of Trees(2018-19). It occupies the entire gallery on the left-hand side of the building, using long drapes of translucent fabric that hang from the ceiling in concentric circles. 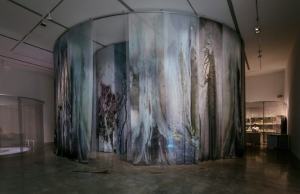 Photographs of trees have been printed onto these monster curtains, light flickers from projectors as viewers wind their way into the centre of the room. Three small satellite galleries act as information stations, laden with books, specimens, and elixirs that may be tasted during specified hours. If it sounds over-elaborate, that’s not an uncharitable thought. Laurence is no Minimalist. She packs an enormous amount of material into her large-scale works, as if concerned that missing a detail would lessen the force of her message. The reality is exactly the opposite: the sheer density of data obscures any analysis, beyond the fundamental idea that it’s got something to do with trees, and trees are very important. Laurence has previously accused me of not liking her work. She may be right, but it’s not personal. I’ve now had two looks at After Nature, and haven’t been able to warm to the display, notwithstanding the sincere enthusiasm of curator, Rachel Kent, or the fact that I’m completely on-side with the momentous ecological issues. It’s a lot more convincing in the catalogue, the latest in the MCA’s run of hugely impressive publications. Laurence says she struggled to come up with a title for this exhibition, finally settling on After Nature, from a book-length poem by W.G. Sebald. It’s a good title, brief and suggestive. My own choice might have been something more cumbersome, along the lines of: You can’t dislike this show – I’m saving the planet! If we agree with Laurence’s green politics and her commitment to conservation and ecological issues, does that automatically mean we have to love her art? I’ve been looking at Alexander Calder’s work in preparation for a forthcoming show at the National Gallery of Victoria, and the disarming simplicity of those sculptures stands in stark contrast to Laurence’s crowded, rhetorical installations. It reflects, in part, the difference in our expectations of the art being made today, as opposed to the heyday of Modernism. In the 1940s and 50s the most radical work may have been nothing but a set of purely abstract forms. While there’s no shortage of contemporary abstract art there’s also a vast amount of work like Laurence’s in which content is crucial. This is not to say Laurence doesn’t think about form. She is conscious of the “poetic” aspects of a piece and adopts devices such as the vitrine or ‘cabinet of curiosities’ to create a range of historical and conceptual associations. Yet the immediate impression one takes away from such works is one of congestion and clutter. There are too many diverse objects and specimens laid out in case after case like some fantasia of natural history. When we see such items in the Australian Museum or the Museum of Applied Arts and Sciences, they are carefully labelled and classified. In Laurence’s installations the borrowed museum items are used to create a poetic effect. 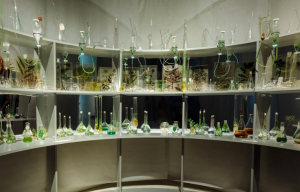 She employed chemical symbols in the same way in an earlier series of works on the theme of alchemy, as may be seen in a work from the Periodic Tableseries of 1993. 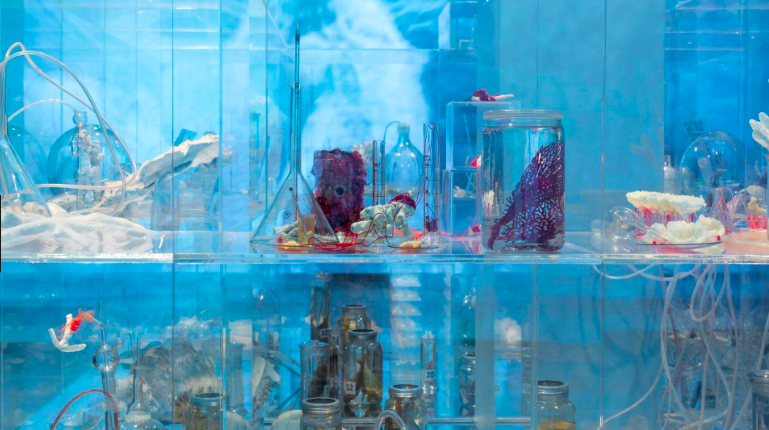 In brief, she creates a fiction of science and natural history for artistic purposes, but the visual impact of such accumulations is rather dull. It’s like looking at museum display cases jumbled together in a random manner. Somehow we are expected to experience a Eureka moment in front of these works, suddenly realising the importance of trees, the fragility of the Great Barrier Reef or the reparations we owe to the environment. There are so many input strands made with the assistance of skilled film-makers and technicians that each piece becomes a jumble of references. Neither does Laurence hide her debt to artists such as Joseph Beuys or the Arte Povera group, but none of those influences have authorised the Bower Bird accumulations she so enjoys. A work by Beuys, by Giuseppe Penone or Mario Merz will usually be constructed around a strong, central image. Laurence might begin with a simple idea but then add layer upon later until the piece becomes a kind of seminar, with so many discussion points all clarity is lost. Ultimately there’s too little art and too much education in these installations. Yet this very fact may be the reason Laurence has achieved such prominence and popularity. Museum-goers today have developed a fixation on learning at the expense of looking, using a trip to an art gallery as an opportunity to find out something about identity politics, ecology, or another big topic. To be more truthful, most of us probably go along in the expectation of having our existing views reinforced by the imprimatur of art and institution. In this respect, Laurence’s exhibition ticks all the boxes – all except that most fundamental form of education: the education of the eye and the pleasure it brings. The most effective works of art engage our attention by the strength of an image, then invite deeper contemplation. They are complex, often ambiguous propositions. In Laurence’s installations the complexity is all on the surface, requiring little more from the viewer than a basic act of political identification. This may give us a warm feeling of being on the right side of history and politics, but we rarely touch on that deeper understanding which is the special province of art.